Hello and Happy Friday! I hope you look forward to reading these Friday Art Journal Every Day posts as much as I enjoy writing them! I'm having a great time and still plugging away in my art journal. How about you? I can hardly believe that another month is almost over! Where does the time go? 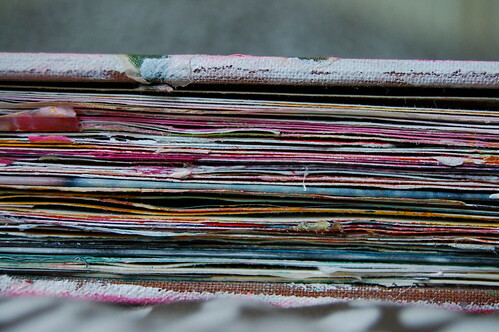 If you want to participate in Art Journal Every Day in March, I will have a new linky list up on March 1 for you. Until then, I think you're going to love this fantastic post on creating monochromatic pages by Hanna of iHanna. I know that I'm inspired to start creating right now! 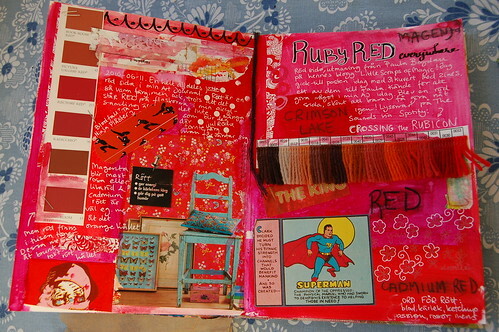 Much of the content of my Art Journals is serendipity working together with my subconscious. 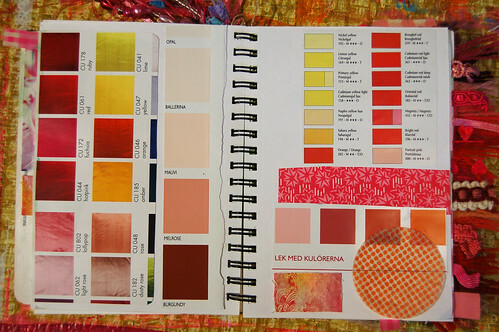 It was like that when my monochromatic page series was born, and I became a collector of colours! But even though I sometimes don’t have any idea how my art is born I thought I’d give you a bit of background on colour collecting and exploring so you can become an explorer of colours too! Anyone can be a colour collector, and it’s very easy to get started. Once you start you will not be able to stop yourself, and it might shift your way of viewing the world a bit, but only in a good way! I promise! 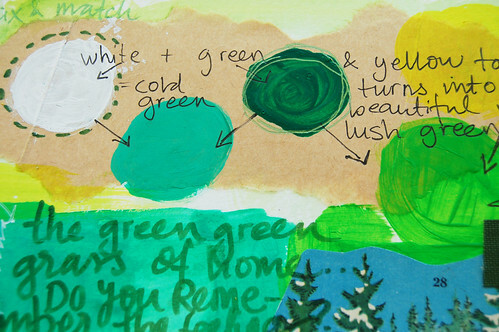 I’ll tell you how I got started and then show you how fun my art journal prompt “monochromatic” is and what you can do with it. It is a perfect start for beginners and newbies because it tells you exactly what to do while still giving you lots of freedom. And more experienced artists can still play (explore/investigate) along with us, because we can’t ever stop playing, right? To me the artist’s real work is to play and learn new things. If you’ve ever collected something you know that once you get started you always have an eye out for that special thing, and you see it more often and notice more details when you are on a search. It is the same thing when you are using your camera, it is like your eyes are taking in more, seeing more beauty somehow. When you collect a special colour and its different hues you will start to notice the colourr in a different way, and you will see it everywhere! Then I went through my paper stash and found images that were mostly red, like a row of different red paint chips from the paint shop, a piece from a Christmas wrapping paper, a cartoon image of super man, some wallpaper, etc. How you compose your page is totally up to you, but choosing what you can put on that page is easy: it has to be “the” colour, or else it won’t be a monochromatic page of course! There are lots of ways you can have fun with this idea, be creative. Play with it and see what you come up with. If you want to see how some of mine came out they are on my blog; monochromatic pink, green, orange and turquoise. I’d love to see your monochromatic pages too, so let me know if you make some! Hanna Andersson, a.k.a. iHanna, creates collage, textile art and mixed media, fills her art journals with colour and creates a mess where ever she is. 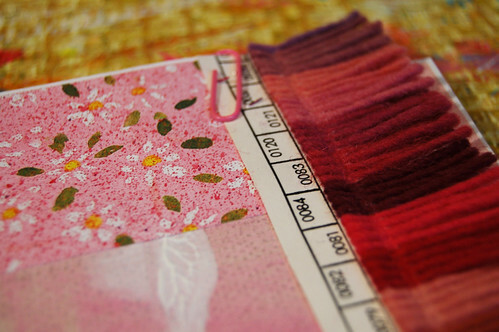 She also digs all kinds of crafts like writing, knitting, sewing, embroidery and photography. iHanna has self published a book called The Creative Life and was one of many artists that was features in Dawn Sokol’s book 1000 Artist’s Journal Pages. iHanna lives in Sweden. Her blog is all about creative adventures and everyday exploring.